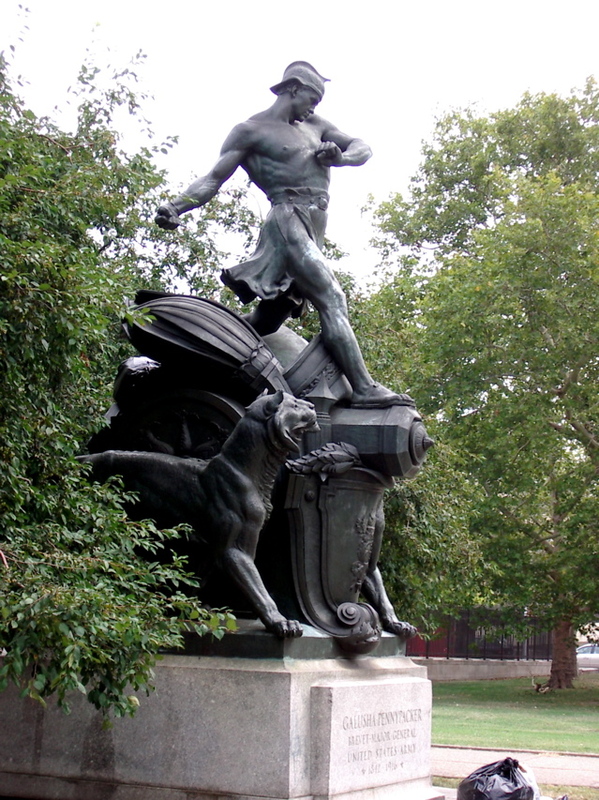 The General Galusha Pennypacker Memorial, created by sculptor Charles Grafly, stands along Logan Square on Philadelphia's Benjamin Franklin Parkway. Pennypacker, a Chester County native, was the youngest general in the Civil War. In 1861 Captain Henry Guss raised the 97th Pennsylvania Regiment for three years of service in the Civil War. Among his volunteers was Galusha Pennypacker in command of Company Although he was but 17-years-old. Pennypacker served throughout the war and was wounded at least seven times. On January 13, 1865, Colonel Pennypacker led his brigade ashore at Fort Fisher (painting below/right.) Two days later he was leading his men in the assault when the color bearer fell and Colonel Pennypacker grasped the flag and valiantly carried it forward to plant it on the enemy’s works. Wounded yet again, the valiant young veteran was awarded the Medal of Honor and promoted to Brigadier General. At age twenty, he became the youngest general in U.S. Army history, a record he holds to this day. War Service April 1861 enlisted in 9th Pennsylvania, August 1861 recruited 97th Pennsylvania - Capt., Maj., served in Florida, Ft Wagner, Drewry's Bluff, Cold Harbor, Petersburg, August 1864 Col., Ft Fisher (w) - Medal of Honor, February 1865 appointed Brig. Gen. of Volunteers. Brevet Promotions Brig. Gen. U.S.A. March 2 1867, Maj. Gen. U.S.A. March 2 1867. Post War Career Army service, frontier duty, retired 1883. Galusha Pennypacker, hailing from Chester City, Pennsylvania, became one of the youngest generals to serve in the Civil War. He grew up in Valley Forge, Pennsylvania in the very home occupied by George Washington and used as headquarters during the Revolutionary war. Intelligent, manly and most genial, young Pennypacker enlisted in the war at age 16. Soon, he was elected captain. Pennypacker rose steadily through the ranks, having serve at Drewry's Bluff, Cold Harbor, Petersburg and Fort Fisher where his courage and leadership earned him the honor of "Hero of Fort Fisher." Just before his 21st birthday, he was made a brigadier general. He served in the South during Reconstruction and in the west doing frontier duty. General Pennypacker remained a bachelor after the war retiring at age 39 and dying in Philadelphia on Oct. 1, 1916 (aged 72). 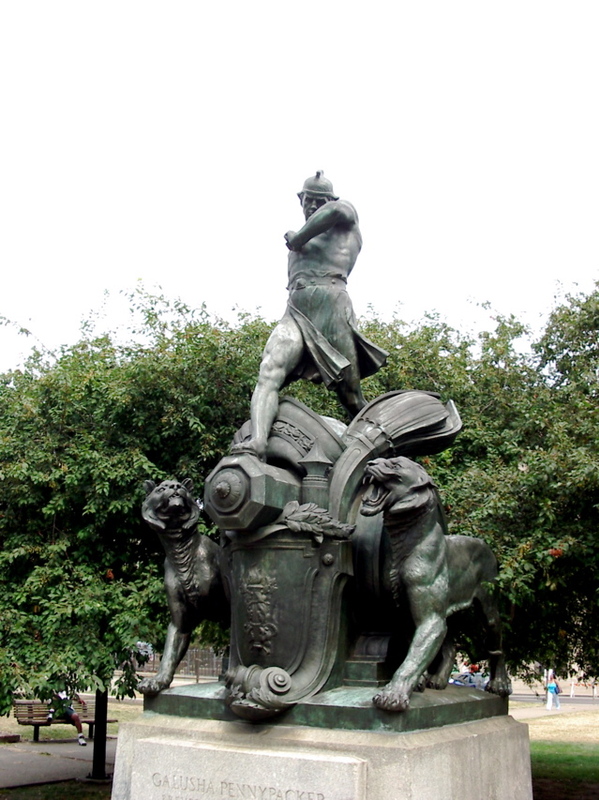 Charles Grafly (December 3, 1862 - April, 1929), American sculptor, was born at Philadelphia, Pennsylvania. He was a pupil of the schools of the Pennsylvania Academy of the Fine Arts, Philadelphia, and of Henri M Chapu and Jean Dampt, and the École des Beaux Arts, Paris. He received an Honorable Mention in the Paris Salon of 1891 for his "Mauvais Presage," now at the Detroit Museum of Fine Arts, a gold medal at the Paris Exposition, in 1900, and medals at Chicago, 1893, Atlanta, 1895, and Philadelphia (the gold Medal of Honor, Pennsylvania Academy of the Fine Arts), 1899. In 1892 he became instructor in sculpture at the Pennsylvania Academy of the Fine Arts, also filling the same chair at the Drexel Institute, Philadelphia. He was elected a full member of the National Academy of Design in 1905.